This blog post contains the translation of two news articles published on consecutive days. On day one, it was reported that there was a land dispute in Sanzhou village, Shunde city, Guangdong province. A hundred or so thugs showed up to assault the villagers, who then sounded a general alarm to mobilize nearly ten thousand villagers to reverse-surround the thugs and hold them hostage. But we don't know what happens next. On day two, it was reported that mediation with the police ended up in the thugs being taken into custody, the land developer promising to pay compensation to the injured villagers and a halt to all construction activities until the dispute is resolved. Now what is unusual is that the first day's report was in Apple Daily and the second day's report was in Oriental Daily. These two newspapers are diametrically opposite to each other in editorial and market positioning. Most people will read one but not the other, and that means they only get half the story -- unless they read everything on the Internet (like I do). But because these two newspaper covered this, you are also guaranteed that the story is true -- if Oriental Daily had found anything wrong with Apple Daily's initial coverage, that would have been their headline story instead! That is the whole point of competitive media that monitor each other. (Apple Daily) June 15, 2006. Yesterday, a member of the Shunde city, Lunjiao town, Sanzhou village committee confirmed to this newspaper that around noon the day before yesterday, more than 10,000 villagers surrounded and assaulted about 100 gangsters. As of yesterday afternoon, he estimated that there are about 2,000 villagers protesting on the site of the land developer and refusing to leave. According to reports, about 5,000 mu of land have been requisitioned cheaply by the government and sold at market price to developers since 1993, with some officials pocketing the price difference. A villager told this newspaper that the incident occurred at the Jade Beauty Garden and Jade View Garden commercial housing sites. The developer was ready to finish work and deliver the houses at the end of the month, so a large number of villagers showed up to protest the inadequate compensation for their land. About 100 thugs suspected to be employed by the developer surrounded the protestors, intimidated and assaulted them. When other villagers heard the news, they banged on the gongs and drums and immediately called thousands and thousands more villagers to the scene. Now it was the thugs who were outnumbered and surrounded. According to reports, the thugs have been harassing the villagers for two to three days already, but the public security bureau ignored their presence and this eventually led to the violent conflict. A villager told this newspaper yesterday that when the villagers surrounded the thugs, there were nine police vans at the scene, but the police officers just sat inside the vans and watched the fight. During the physical brawl, about six or seven villagers were lightly injured, but many of the thugs were seriously injured. In addition, the villager claimed that there were two plainclothes police officer who were taking photographs for evidence and they were also injured by the villagers. According to the villager the land development company is controlled by officials. The land that the development company obtained was not paid for by cash, but was listed as debt cancellation. The villagers have no idea when the village committee ever borrowed money nor where that money went. "We won't give them medicine, we won't give them food!" On the day before yesterday, after the fight between more than 10,000 villagers and about 100 gangsters in Sanzhou village, Shunde city, several dozen of the gangsters have been 'detained' by the villagers and some of them are bleeding from their wounds. But the villagers would not stop their bleeding, or offer them medical care. They were not fed as of yesterday afternoon, because the villagers are still very angry. During the chaotic fight on the day before yesterday, many of the thugs tried to run away and break through the cordon formed by 10,000 people. More than 60 were unable to escape and were locked up in an office belonging to the developer. On the afternoon of the day before yesterday, some of the detainees broke the office windows and escaped. Several villagers received cuts from the broken glass. A villager told this newspaper yesterday afternoon: "There are still more than 30 thugs locked up inside the office. Three or four them are seriously injured. We won't give them medicine and we don't care if they are bleeding. I don't think that they have been fed yet." As for the rumor that three or four people are dead already, the villager told this newspaper: "Nobody died. If there were deaths, this would be a major incident." Another eyewitness said: "There two or three thugs who are seriously injured. I saw one covered in blood, and his shoulder had been smashed by wooden sticks." (Oriental Daily via ChineseNewsNet) June 16, 2006. The police-civilian confrontation in Sanzhou village, Shunde city, Guangdong province has been peacefully resolved after two days. During the process, there were dangerous situations in which people said that they would die together with the government officials trapped in the cars and the sixty mysterious detained men. A peaceful solution was achieved after mediation from all sides. At around midnight yesterday, the villagers had set up three circular perimeters and were prepared to face the anti-riot police poised to enter the village. They had also surrounded a house in which more than 60 mysterious men were holed up. Suddenly, two of the mysterious men pried open the iron bars on the windows and escaped into the night. The more than 1,000 villagers at the scene were emotionally incensed and began to use their sticks to bang on the window panes of the surrounded house and on the surrounded police cars. In one of the surrounded cars was a local government official and a police officer. The anti-riot police amassed outside did not know what was going on and thought that another physical fight was taking place, so they went into alert with their shields and batons. 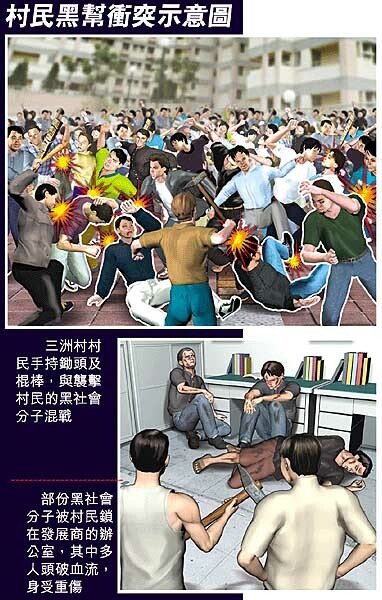 Then someone proposed setting fire to the surrounded police car, while someone else threatened the police that if they should attack, then it will be 一鑊熟 (literally, "everything in the wok will be cooked" and this is a suicide-murder threat). Fortunately, the police acted with restraint and the elders and women among the villagers calmed down the angry young male villagers. While bloodshed was avoided for the moment, the detained mysterious men and the government officials were still "birds in cages." Early morning yesterday, the village representatives made three demands to the mediating government officials: 120,000 yuan in medical compensation for the villagers injured during the fight on June 13; the development is to be halted temporarily without retaliation from the developer; the local government will investigate the matter and provide an explanation to the people. The local mediators pointed out that detaining officials and damaging public property and vehicles are serious crimes and that lives may be lost if this goes on any further. The police promised not to pursue the villagers and to detain the sixty mysterious men for further investigation. So on yesterday afternoon, the villagers released all the detainees while asking the government to pay attention to the land compensation issue as well as the use of thugs to intimidate the people.